The most auspicious of all nights--Mahashivratri--will be celebrated with great joy at Om Sai Mandir. We will observe an all-night vigil accompanied by all-night prayers, abhishekam, and bhajans. Please do join us and secure the Lord's blessings. Click here to sponsor pujas in the name of your family and loved ones. Holi/Holika Poornima was the day when evil was vanquished in the form of Holika. Come and get blessings for the two-day festivities that will be held. Special colors will be applied to Baba to adore Him. Special bhajans will be held on Thursday, March 21 from 7 PM to 8 PM. Multiple auspicious events fall on this very special day. Ugad, Gudi Padwa, Cheti Chand, and the new year of many dialetcs in India and abroad. Also, Vasant Navratri begins on this very day and will continue till 04/13/2019. Special havans, chanting of 24,000 Gayatris, and various other prayers and festivities will be observed at the mandir. Please do join us. On this holy day, the Navaratri Homam at the Mandir will conclude. Additionally, prayers will be offered to Lord Sri Rama, Sri Sit Rama Kalyan will be performed and special festivities for Baisakhi will be observed as well. Please join us! 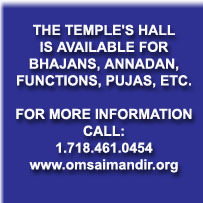 The Flushing Sai Baba temple hall is available for bhajans, annadan, functions, pujas, etc. For more information, please call us at 1.718.461.0454. Om Sai Mandir is organized exclusively for charitable, religious purposes and is a non profit organization, exempt under section 501 (c) (3) of the Internal Revenue Code. 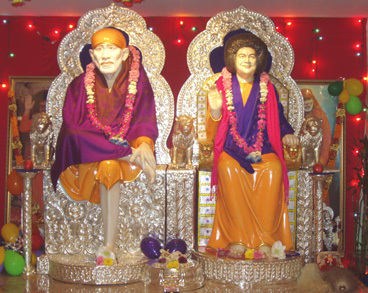 The temple (mandir or center) is dedicated to both Shri Shirdi Sai Baba and Shri Sathya Sai Baba. Submit your e-mail address to receive FREE newsletters, updates, festival reminders, and more. Click here to sponsor pujas online. Click here to watch the Balloon Miracle Video. Copyright (c) 2017, Om Sai Mandir. All Rights Reserved.